Stream edge communities and the streams they line typically form a relatively open gap in an otherwise wooded landscape. Streams and rivers, of course, are aquatic habitats. But there are also distinct land habitats that occur along streams and rivers. Stream edge habitats include sandbars, gravel washes, and the banks of streams and rivers. Stream edge natural communities occur along streams and rivers, where frequent flooding deposits sediment or erodes the land along the channel. 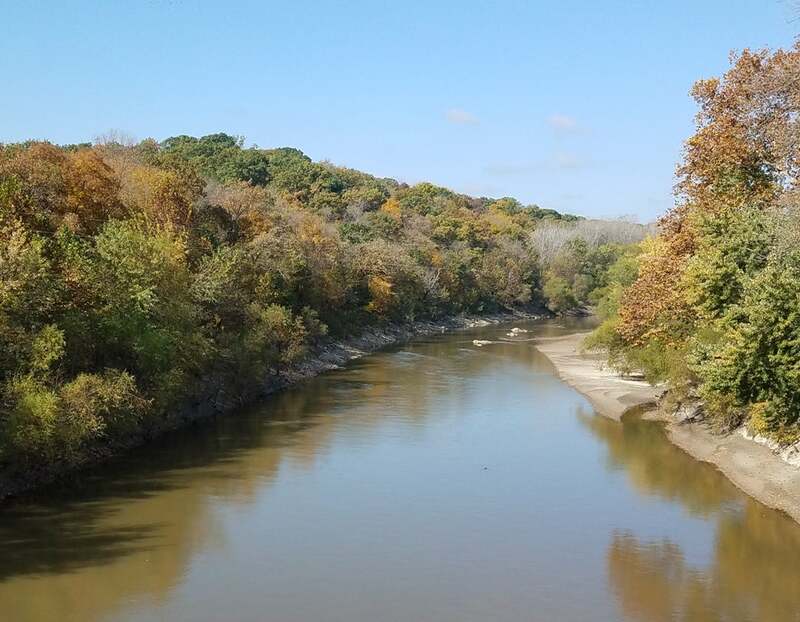 Streams in northern Missouri, like the Grand River, create stream edges with plenty of sandbar natural communities. The velocity of flood waters affects the vegetation directly and forcefully. The high impact of water flow makes stream edges, especially sandbars and gravel washes, some of the most unstable of all natural communities. The substrates don’t develop well-defined soil profiles, because flooding keeps depositing new mud, silt, sand, gravel, boulders, logs, leaves, and so on, constantly shifting the substrates. Stream edge communities constitute a linear boundary along streams, so that when you include both sides of the stream edge, plus the stream itself, there is a corridor, a relatively open gap, through an otherwise wooded or heavily vegetated landscape. Many animals use stream edge communities as passages for travel. A single major flooding event can reshape, reorganize, and relocate the components of a stream edge community. A big flood can wash away sandbars and gravel washes and rebuild them elsewhere; it can reroute a stream’s channel through the landscape; and it can sweep away vegetation while creating new places for plants to take root. One thing stays the same, however: the various stream edge and bottomland communities always occur somewhere along the stream and its floodplain. There is a predictable progression of habitat types as you travel away from a stream and gradually move on to higher ground. First, there is the stream itself; then the stream edge, gravel bar or wash, steep streambank, riverfront forest, and mesic bottomland forest (which occurs on natural levees), then, continuing away from the stream, you descend slightly again to wet-mesic bottomland forest and wet bottomland forest (both of which can occur in complex mosaics, especially along the larger rivers of northern Missouri and in the Bootheel). Here’s a term you should know: Riparian. To call something “riparian” means that it is associated with the banks or with the entire active floodplain of a river or stream. The riparian zone is a fairly broad conception of streamside habitats. It is where land and aquatic habitats join. Stream edge habitats are included within any definition of a riparian zone. Riparian areas include stream edge communities, but they can also include all or parts of other habitats along streams, including bottomland prairies, bottomland woodlands, bottomland flatwoods, bottomland forests, and riverfront forests. In riparian areas, the soils are relatively moist or wet, compared to the rest of the landscape, so plants that grow in riparian areas are adapted to moist or wet soils and to some degree of flooding. Riparian vegetation is typically lush and wooded, compared to nearby land. The relatively lush vegetation supports a relatively high concentration of insects and other small animals. Many larger animals, from birds to raccoons to deer, are drawn to riparian zones for water, food, and shelter. Birders know to visit riparian areas during spring and fall, because many, many migrating birds are drawn to streamsides. Stream edges, like most other land habitats, have different characteristics depending on factors such as rock and soil types, geologic history, whether the area was glaciated or not, the amount and types of vegetation nearby, and so on. Because stream edges represent a meeting point between land and water, they are also influenced by aquatic factors, such as the amount and duration of flooding, the velocity of water and flood flow, stream gradients, and their position in relation to the stream’s entire course (for example, located at the headwaters, or along the larger downstream sections). Ozark streams are bordered by bluffs and flow over exposed bedrock. Rock, cobble, and gravel line the edges of Ozark streams. Botanists have pointed out that separate stream systems often have their own distinctive suites of stream-edge plants occurring on their gravel washes, sandbars, and stream- and riverbanks. This is similar to the phenomenon where separate stream systems host their own unique species of fish, crayfish, and other aquatic animals, which cannot travel overland to colonize nearby stream systems. Stream edge plants have the same situation, as streams are divided by woods or grassland habitats in which they cannot survive, even though another stream system might only be on the other side of a ridge. In Missouri, regional geography plays a major role in the character of stream edge communities. Fall color along the Upper Grand River near Elam Bend Conservation Area, southern Gentry County. The low-gradient rivers in glaciated northern Missouri and in the Bootheel lowlands create stream edges with plenty of sandbar natural communities. This occurs, for example, along the large Missouri, Grand, and Mississippi rivers. The smaller streams in these regions historically meandered across their wide, fairly flat floodplains; these streams build up gradually sloping sandbars on the insides of their curves, and they cut steep-sloping banks on the outsides of the curves (as well as in straight runs). In the Ozarks of southern Missouri, rivers and streams have cut their channels down through ancient bedrock, creating gravel bars, rocky bluff-lined streambanks, and breathtaking vertical cliff faces. The gradients are higher in these streams, so the flow velocity is higher. There is little sand along these streams; instead, rock, cobble, and gravel line their edges. The gravel bars along clear, spring-fed Ozark streams are beloved by canoeists, swimmers, and campers. Missouri has three types of stream edge natural communities: sandbar, gravel wash, and streambank and riverbank. Sandbars in Missouri mostly occur in the glaciated northern half of the state, along the Missouri and Mississippi rivers, and in the Mississippi lowlands in the Bootheel. Where sandbars have recently formed, little vegetation exits, but older sandbars may have up to 60 percent ground cover. Most of the vegetation is annual wildflowers (forbs) and grasses. The shrubs are usually willows. Trees are usually absent, although scattered groups of seedlings may occur. In Ozark streams, bluffs and bedrock are relatively permanent obstacles causing gravel washes to keep forming at the same places along the stream. Gravel washes in Missouri mostly occur in the Ozark Highlands and parts of the Osage Plains. Unlike the sandbars in northern Missouri, gravel washes are much less likely to change position along the river, since the cliffs, bedrock outcrops, and large tracts of nearby forest provide fairly permanent obstacles that cause gravel, cobble, and other materials to keep being deposited in the same places. As with sandbars, sections of gravel washes that were recently formed have very sparse vegetation, while undisturbed sections (gravel bar terraces) can have plenty of shrubs, wildflowers and other forbs, and grasses. In places on gravel bars where trees and shrubs become so established that they hold the substrates in place, they become riverfront forests. Missouri's gravel wash natural communities are usually found in Ozark streams. Witch hazel/swamp dogwood/ninebark subtype: boulder, gravel, and bedrock washes on relatively small, high-gradient, often intermittent streams. Willow/water willow subtype: gravel bars along relatively large, permanent streams and rivers. Dense patches of water willow stabilize gravel at the edge of the stream. Blue beech upland waterway subtype: the primary headwater zones of larger streams and rivers, including intermittent streams, valley washes, and ravines. There is not a well-defined channel or watercourse, but waterborne sand, gravel, and other materials collect at the bases of ravines, and distinctive plants grow there: blue beech, ninebark, swamp dogwood, and great Indian plantain. Streambanks and riverbanks comprise the sloping to steep banks of the floodplain, just above the water surface or above the surface of a gravel wash along a river or stream. Where a stream curves, this community forms on the outside of the curve, while alluvial (river-borne) materials accumulate on the inside of the curve. Streambanks and riverbanks are frequently flooded, and they can remain underwater for a few hours (in upstream, headwater locations) or for weeks (along large rivers). Plants on stream- and riverbanks can be located on the sloping embankments, on the overflow borders, or at the base of adjoining talus slopes or bluffs. In forested regions, trees dominate, while stream- and riverbanks in prairie and savanna areas have scattered, trees, shrubs, and grasses. Headwater locations typically are tree-lined (grass-lined in prairies). Plants on riverbanks are subject to high-velocity flooding. If the substrates are stable enough, trees often lean outward toward the water. Downstream, larger rivers are lined with zones, starting with shrubs and nonwoody plants closest to the stream, and with vines and trees on the higher ground and natural levees, farther from the water. If the substrates are stable enough, these trees often lean outward toward the water. High-velocity flooding often undercuts trees and other plants, uprooting and washing away many, exposing the roots of others. Stream- and riverbanks occur throughout Missouri. Because the geology, landforms, water flow patterns, and other factors vary by region — and influence the character of stream- and riverbanks — these streamside communities are divided into four subtypes based on region. The Glaciated Plains/Big Rivers subtype is associated with the broad floodplains of large, meandering streams and rivers of glaciated northern Missouri and the unglaciated Osage Plains of western Missouri. Over time, as the stream and river channels shift their paths across the floodplain, they often create natural levees on which forests eventually develop. On the opposite bank, where the stream deposits sand, silt, clay, and other materials, new land gradually develops. As this new land grows toward the streambank, a predictable succession of plants colonizes it: first annual, then perennial grasses and sedges, followed by shrubs and then trees. Prairie headwater streams occur in prairies where natural drainage develops entrenched gullies and then true waterways. The Prairie Headwater Stream subtype is specifically associated with true prairies, which in our state almost always occur in the plains of northern and western Missouri. This stream edge subtype begins in the shallow valleys of prairies, at the point where drainage bordered by swales starts to develop entrenched gullies and then true waterways. These stream edges are some of the few places on native prairies where woody plants may survive, as the extra moisture along stream edges affords protection from the effects of fire. Characteristic plants include false indigo, buttonbush, swamp dogwood, and grasses and forbs associated with prairie wetlands. The Ozark subtype is associated with entrenched streams and rivers as they wind across their narrow floodplain on stable bedrock, bending when they encounter steep rocky bluffs and cliffs. Where the river bends, the inside curve contains floodplain materials deposited by the stream. In open, sunlit places, bedrock streambanks contain a variety of grasses, sedges, and other nonwoody plants, plus shrubs. Shaded bedrock areas have more shrubs, ferns, and mosses. Another variation occurs in the St. Francois Knobs and Basins and nearby igneous-rock areas; here, the streams are bordered by igneous talus or sandy terraces, which are stabilized by mats of shrubs and nonwoody plants. Common alder, winterberry, and royal fern are some of the plants especially associated with these igneous stream- and riverbank communities. The Lowlands subtype comprises streambanks along the sluggish streams and rivers in Missouri’s Bootheel lowlands. Many of the plants characteristic in this subtype are usually associated with the southern coastal plain (that is, in states south and southeast of Missouri): bald cypress, willow oak, red maple (Drummond’s maple variety), water elm, Virginia willow, swamp rose, water willow, and lizard’s tail. The fact that stream edges represent an intersection of different habitats makes them attractive to many types of animals. Stream edges are open areas next to woods; they are a source of water; and they support lush plant life and an abundance of aquatic, terrestrial, and flying insects. Stream edges are home to animals that specialize in this habitat, but they also attract many animals that come for foraging or nesting opportunities. These animals have more generalized habitat requirements and are not restricted to the stream edge habitat. Mammals that are strongly associated with stream edge habitats include river otter and muskrat. Raccoons are often seen on gravel washes. Many birds are attracted to stream edges, especially migratory songbirds. The endangered interior least tern and piping plover are restricted to sandbar communities. They nest on Mississippi River sandbars — islands in the middle of the river where they are safe from land-based predators. The spotted sandpiper is also strongly associated with sandbars. Other vertebrate animals include Fowler’s toad and the northern cricket frog, which are both strongly associated with sandbars. Watersnakes are common along gravel washes. Many species of dragonflies and damselflies cruise up and down the open corridor along streams, hunting insects that are likewise attracted to the streamside habitat. Many species of butterflies, including swallowtails, sulfurs, blues, and skippers, are attracted to stream edges where they “puddle” on wet sand or gravel to obtain fluids and salts. Many other insects are especially attracted to sandy areas, including sand wasps, colletid and mining bees, tiger beetles, grouse locusts, and antlions. Along gravel washes, the southern pearly eye butterfly and toad bugs are common. Many types of insects are aquatic in their juvenile stages, then become terrestrial adults upon their final molt; the stream edge community is typically where this happens. The adults of these insects usually meet and mate near the stream where the female will deposit their eggs. Belted kingfishers build their nest burrows in the steep dirt slopes of streambanks. Birds. Belted kingfishers build their nest burrows in the side of streambanks. Other birds that nest along streambanks are yellow-crowned night-heron, green heron, bank swallow, and northern rough-winged swallow. The Louisiana waterthrush forages along streambanks for aquatic invertebrates. Reptiles. Softshell turtles often bury their eggs in nests on sandy banks. Invertebrates. Tiger beetles hunt on sandy streambanks. Several uncommon butterflies are highly associated with stands of wild cane along streams in the lower Ozarks. Devil crayfish dig burrows with mud chimneys along streambanks. Grouse locusts, a group of small grasshoppers, live on sandy riverbanks; look for them on sunny days in late winter. People have greatly altered Missouri’s stream edges in ways large and small. Channelizing (straightening, deepening, or both) of rivers alters flow velocities, sediment deposition, and much more. The Missouri River, historically a low, slow, wide, meandering river with braided channels, has been channelized for barge traffic, and its flow is controlled at dams and reservoirs upstream. Some have described the modern Missouri River as essentially a tremendous, fast-flowing drainage ditch — a far cry from its natural state. The Mississippi, with its series of locks and dams, wing dikes, and levees, is similarly altered from its presettlement condition. In both rivers, sandbars and mudflats were both very common, but now these exist only at point bars and islands. Logging, conversion of native prairies to cropland and pasture, and gravel mining have a big impact on the amounts of sediment that reaches streams and rivers, especially in northern Missouri and in the Bootheel. Decreased vegetation in a watershed increases water flow velocity across the landscape, increasing the amount of eroded soil and gravel that enter stream channels. These materials are deposited downstream in excessive amounts. When trees and other vegetation are removed from along the river edge, riverbanks tend to erode and slump into the waterway, adding more sediment. These increased sediments essentially choke out many aquatic organisms that are not adapted for anything but deep pools, shallow riffles, and an assortment of boulders, cobbles, and gravel. Land practices upland in the watershed have long affected stream edge habitats. Historic overgrazing, land clearing, and conversion to cropland removed native vegetation, exposing the bare soil. When its groundcover plants were gone and the top soil layers were trampled or washed away, the land was no longer able to absorb water — so rainwater ran off the land more rapidly, leading to greater flooding, followed by lower flows. Prior to settlement, dense herbaceous ground cover held and released rainwater slowly into streams, making the stream flows more stable. The streams and wetlands in the Bootheel have experienced the most drastic destruction in the state. The region once held a complex set of meandering rivers, swamps, and marshes. Some 2.5 million acres of bottomland forest and swamp were logged, drained with a series of human-built channels, and converted to cropland. No unchannelized rivers remain in this part of Missouri. Invasive nonnative plants can get established in stream edge communities and displace native plants. Many of these weeds can arrive as seeds or cuttings carried deep into natural areas by the stream water, originating from upstream pastureland, roadsides, or other places weeds abound. Gravel mining removes vegetation and increases siltation, destroying many small animals. Illegal ATV trespass obliterates gravel wash and other stream edge communities; the resulting siltation impacts aquatic communities downstream. Agricultural practices in the watershed can cause pollutants such as pesticides and fertilizers to be washed into streams, negatively affecting aquatic ecosystems. Missouri has few high-quality examples of intact riparian zone communities. There are many challenges for those attempting to protect sections of streamside landscapes. First, the health of a stream habitat depends not just on what happens along its riparian zone, but also on the quality of its entire watershed. So even though a section of stream may be protected within a Conservation Area or State Park, the stream and its tributaries might extend upstream for miles and miles, draining hundreds or even thousands of acres, where land practices might be contributing high sediment loads to the stream. As the health of our stream edge communities goes, so goes the health of our streams, our rivers, and ultimately, our drinking water. For this reason, state and federal agencies have been educating people about the best ways to care for our watersheds and waterways. It is all linked together — soil conservation in agriculture and in construction projects, decreasing erosion, creating riparian buffer strips of vegetation, and finding alternatives to dredging and channelizing of streams. The historic floods of 1993 and 1995 that affected Missouri and other midwestern states convinced many people to question the idea of keeping rivers so completely confined by levees. It became clear that natural riparian vegetation, including wetlands and other floodplain habitats, will provide a “release valve” for rising floodwaters. State and federal agencies acquired large tracts along the Missouri River that now can act as floodwater storage basins. Additionally, they provide rich habitat for many wetland and big-river plant and animal species. Finally, state and federal clean-water regulations help protect our streams from further degradation of water quality. This includes monitoring the effects of gravel-mining operations and prosecution of illegal ATV trespass.